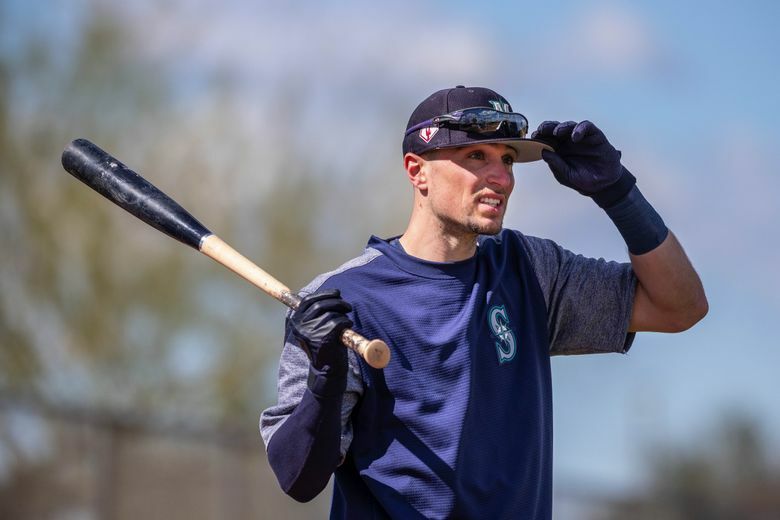 With the Mariners' plan of a stepback in 2019 and a focus on building a young core of players for 2020 and 2021, the former UW standout has become a factor in that plan. “This is a different spring for him," manager Scott Servais said. PEORIA, Ariz. — A year ago, Braden Bishop arrived at his first major-league spring training with the typical wide eyes and nerves of any player entering a world in which childhood dreams are on the verge of becoming real. His locker was relegated to the far reaches of the big league clubhouse of the Mariners’ spring training facility. He was just feet away from having his locker in the hallway leading out to the practice fields. It’s an area where minor-leaguers with little to no experience or non-roster invites are placed. There aren’t signs that say: “Stay in your area” or “Be seen and not heard,” but it seems that way. They were unwritten rules the respectful Bishop obeyed. This year, Bishop finds himself moving up in the world. After being placed on the 40-man roster this offseason to protect him from the Rule 5 draft, he is near the front of the clubhouse in a cluster of players with big-league experience, including J.P. Crawford, Mallex Smith, Domingo Santana and Jay Bruce. Kyle Seager is slimmer and healthier. Will that lead to bounce-back 2019? It’s a location and treatment that he earned. But Bishop and the Mariners know he has higher goals this season than clubhouse real estate. With the organization’s plan of a stepback in 2019 and a focus on building a young core of players for 2020 and 2021, the former University of Washington standout has become a factor in that plan. That opportunity became more pronounced when fellow outfielder Smith arrived at camp with an elbow strain, shelving him from Cactus League games in the near future. With Smith out, Bishop is expected to play heavily in spring games. He started Thursday’s Cactus League opener in center field. Smith seems unlikely to be ready to go to Japan for the two exhibition games and two regular-season games in mid-March. The Mariners could put Bishop on the expanded active roster as an extra outfielder. It’s tantalizing to think about. The Mariners love who Bishop is and who he has become as a player. They knew they got an outstanding human being when they selected him in the third round of the 2015 draft. Bishop grew into an All-Pac-12 performer at UW while also becoming a tireless advocate and fundraiser in the fight against early-onset Alzheimer’s disease, which his mother Suzy is battling after being diagnosed almost five years ago. Time hasn’t healed the pain. He tries to prioritize baseball as a job when it’s time to work. His off-the-field energy is channeled into his “4Mom” campaign that has grown into a full charitable foundation. Bishop was honored with the Dan Wilson Community Service Award for his efforts in 2018. Bishop’s latest fundraiser is a charity golf tournament on March 3rd at the Top Golf in Glendale. He’s invited players from the Mariners and other teams to participate. And yet, his job is still baseball. And his ultimate goal is within reach. It might have loomed even closer if not for an injury that derailed his 2018 with Class AA Arkansas. On July 19, Bishop suffered a broken right forearm that ended his season. Bishop needed surgery, and a metal plate and six screws were inserted into his wrist. At the time, he was hitting. 284 with a .361 on-base percentage, 20 doubles, eight homers and 33 RBIs. The Mariners were on the verge of promoting him to Tacoma, putting him in line for a possible September call-up to the big leagues. He wouldn’t allow himself to dwell on it. Bishop returned to weight lifting in October and started to easy his way back into baseball activities. Anything that affects the hands or wrist area is a complex situation for position players. The broken bone wasn’t the only baseball issue that Bishop endured. He started the 2018 season in a miserable slump. After hitting .336 with an .865 OPS in 31 games with Arkansas to end the 2017 season, Bishop figured he’d put up similar numbers in his return in 2018. Instead, he hit .154 in his first 23 games. Bishop believed in his process, and yet, it wasn’t an enjoyable time. He kept grinding in the batting cage, trusting that his preparation and approach would find success. It came with a torrid run, hitting. 331 with an .861 OPS in his next 61 games until the injury stopped his season. With his speed and defensive ability, Bishop profiles as a fourth outfielder. But his growth as a hitter from a singles hitter at Washington to a player that drive the ball from gap to gap could push that projection. But Bishop has gotten back up every time and moved ahead of where he was before the stumble. It could push him to the big leagues this season.